Devon & Somerset Fire & Rescue Service have been working alongside the National Fire Chiefs Council and a North Devon family to highlight the potential dangers of having a firework display at home. The Fire Service encourage everyone to attend an organised firework display as they are safer and they have safe and well organised displays. In her own words Stephanie explains the events of the evening. We were really looking forward to going to the local pub for the professional display that they were putting on but Maisie’s sister was feeling poorly and so we decided against taking them all out. My husband had been into town and came back with a small box of silent fireworks from a newsagent to do in the field. I thought nothing of it as I had always grown up with fireworks going off in the garden at home and we'd done them ourselves before. That evening just after 5pm my husband set the fireworks up in small field behind our house. He is a sergeant in the army and the most safety conscious person I know. My mum, Maisie and myself stood ten meters away - twice the recommended 'buffer zone' – alongside her brother and sister and waited for the fireworks to start. The first was a small Catherine wheel, the children were distinctly unimpressed! The next was a firework that sent small flares into the air that exploded into pink colour. The first four went up one and after the other and then a pause. The fifth flare instead of going up flew horizontally across the field and everyone started screaming. It was only as it exploded and Maisie's scarf caught fire did it become apparent the flare had become caught in her clothing. My husband had a bucket of water next to the fireworks and he immediately threw it over her, while my mum who is a nurse, started to pull off her clothes. I’m a police officer and have been for 10 years and I’m usually quite good in a chaos situation, but when it’s your own child it’s so different. I just stood there screaming. I remember my mother screaming instructions at me and the next 24 hours are a daze. I ran to get the burns kit from the barn and called the ambulance. I felt like the most awful parent in the world ringing the ambulance on bonfire night because our child had been burnt. The operator was brilliant, so calm and reassuring. When the paramedics arrived they gave Maisie morphine immediately and said she needed to go to hospital. When they checked the dressing my mum had put on I remember thinking it didn’t look that bad, that we'd probably have to stay in overnight in the local children's ward. We went to the AE in Barnstaple and the Doctor said he thought some of the burns were full thickness so we would have to be transferred to Bristol. We decided to drive her up, as the ambulance would have taken five hours. We went straight into the specialist burns unit which has four beds and it was then that the seriousness of the situation started to sink in, by then it was about 1.00am the next morning. Maisie had temporary bandages put on by the nurses and was taken to her room, my husband and I slept next to her, even though she had been given morphine she tossed and turned all night. The next morning they gave her a bath to wash the burns and see how bad they were. They warned us it was going to be horrible and we didn't have to stay, but there was no way we were leaving her. Horrible was an understatement, I've never heard a child scream in pain like that. My husband had to hold her down as the two nurses weren't strong enough. Later that day she went into surgery for the first of many times to have her burns scrubbed. She came out completely covered in bandages. From there on she was in hospital for another seven days, having a total of 5 general anaesthetics. On the second night she developed a severe temperature, and I remember the doctor telling me that the burns wouldn't kill her but an infection could. In order to check her they had to take blood and I remember her screaming, it took me and three nurses to hold her down. That morning she went back into surgery to have the thickest burns cut out because of the possibility of infection. Thus continued a day in day out routine of pain killers, medication, scrubbing, and bandage re-dressing. Day five she had the first skin grafts taken from her legs, which Maisie found more painful than the burns. Day six involved a further skin graft as the first hadn't stuck properly. That weekend Maisie was allowed to come home temporarily as we were had to attend my father’s funeral. She was literally wrapped in cotton wool on the sofa and everyone was so pleased to see her. Maisie needed a cocktail of medication every couple of hours and I remember feeling completely stressed with this responsibility, having relied so heavily on the nurses to keep her as pain free as possible it was now down to us. On Sunday we took her back to the hospital for another three days, where she had a third skin graft. After this she came home to be treated as an outpatient and the Specialist Burn team visited her every three days over a two week period, to change her dressings. This took place in the bath and even though she was sedated she kicked and screamed. Now the scabbing has healed she can wear a silicon dressing. Once a month we return to Bristol for a review with her plastic surgeon. The next stage is reducing the worst of the scars as the body always over heals its self, which is why you get the lumps and the bumps. They are now talking steroids and lazar treatment and it will be two years before it is going to look like the end result. Maisie is doing really well and the amazing thing has been her resilience and positive spirit. In January she went back to school. At first she wasn’t allowed out to play, but now she is completely back to normal. The doctors say that Maisie was very lucky - if it had gone a few inches either way, she could have been blinded or have had breathing difficulties for the rest of her life. 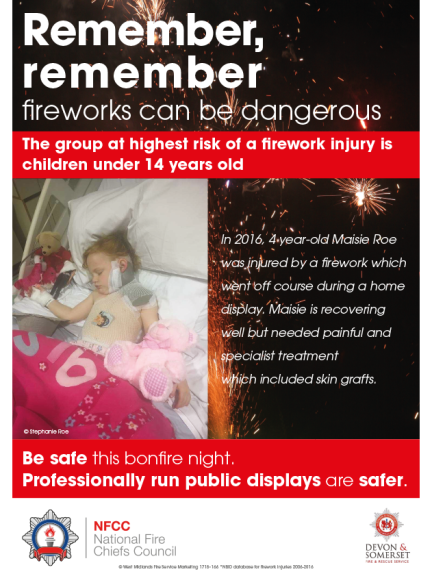 I wanted to tell Maisie’s story so if anyone considers having fireworks at home to think again and instead attend their local firework display. I remember in the past we didn’t think twice about having fireworks at home and when one firework whizzed off in the wrong direction it was funny. Now when I hear of kids throwing them at each other in the street it makes my heart sink. I wouldn’t want another family to have to go through what we have. When I think how relatively minor her burns are and how much pain she has been through it's terrifying. Also how long the route is going to be to get her back to normal, it’s very scary. I always try to remember it could have been so much worse. We will certainly never, ever have fireworks at home again. Devon & Somerset Fire & rescue Service are encouraging everyone to take great care this bonfire night and recommend that you and your family attend an organised display. These are by far the safest place to enjoy a firework display. Remember, remember organised displays are the safest place to enjoy a firework display.